The Prescription for Downtown’s Woes is a Healthy Dose of Free Enterprise. In past years I have written about the untapped potential in the heart of Gallup, so with recent interest in the north-tracks district expressed by a Downtown Redevelopment Plan it bears repeating. Remember when the Courthouse Square was constructed? Several structures were demolished and despite the plaza’s horrible location (you can’t even see it from the streets) the open spaces and parking were a downtown upgrade and the newly constructed Camille’s became an overnight sensation. So with downtown redevelopment plans under way in attempts by the city to garner more funding I found it a little peculiar when I encountered such adamant opposition to any such notions of tearing down a couple more buildings to enhance the downtown atmosphere. For city bureaucrats, BID, MRA and ACD it appears to be a forbidden topic. Yet who are they or even I to say what should happen to other people’s property? That is up to the landlords. They are the ones stuck with paying taxes on vacant buildings. Bureaucrats can spend millions upon millions of other people’s money on failed projects and never even be held accountable, including by an enabling media which believes government projects are the panacea for all problems. Consider this, if the walkway connecting Aztec and Coal has succeeded in facilitating downtown accessibility why not extend it to 66? That would require the removal of two more buildings, likely the old Jet Sight Optical on Coal and part of the one story bordering Kitchens Opera House’s east side on 66. This would also allow for a spectacular neon-lit pedestrian overpass leading to the ‘new old town’ private sector development north of the tracks, of which I will address in part two. Another ideal walkway mall location requiring demolition of two buildings is directly across from Sammy C’s, connecting Coal and 66. Downtown landowners should know that businesses adjacent to walkway mall areas benefit the most. If you look at other revitalized downtown districts across the country, one thing I’ve noticed is an attempt to create a mall atmosphere of open spaces for pedestrians and easy parking access, not to mention opening up dark alleys. After all, it was the popularity of shopping malls and big-box stores which led to the demise of Main Streets. One of the big appeals of ‘old towns’ such as Santa Fe and Albuquerque is the central open park area surrounded by shops on the perimeter. Pedestrian walkway mall areas also allow bordering buildings to offer easier business access as well as outdoor cafes. The ABQ Uptown in Albuquerque is a recent private sector creation of an outdoor mall combining elements of shopping mall and downtown atmospheres. Streets run thru the ABQ however pedestrian space with easy parking dominate. That is the model which downtown owners should be looking at if they are truly interested in making big profits rather than just paying big taxes on vacant buildings. And it is the property owners, the landlords who will or won’t solve the vacancy problem, not the government. All we ever hear about are the city’s efforts to revitalize, however aside from the streets they don’t own downtown and what they create more than anything are large stacks of reports. The big decisions have to be made by the owners. They are the ones in control. With assistance from the GGEDC it took an outsider family with a bold vision to purchase the dormant Gamerco Associates properties and initiate plans for an industrial hub complete with a railroad spur. Bear in mind only 13% of McKinley County is privately owned, a tremendous burden for economic development. I would think downtown property owners would want to collaborate and figure out a way for all of them to profit. Do they really want to continue down the same path of downtown decline? If there was such a meeting the city manager could be included to answer questions and hear requests. All of the collaboration would likely be an economic moot point though unless Gallup’s ‘gold mine’ is developed. 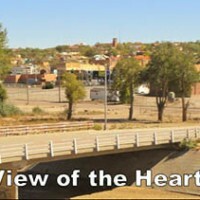 The gold mine is the large undeveloped area north of downtown between the freeway and tracks which has been begging to be developed since the elevated freeway opened in 1978, offering to all eastbound passersby something which very few communities were rewarded, a view of the center and heart of Gallup – and it hasn’t been a pretty sight. We’ve learned the folly of city planned development such as the Courthouse Square. Government funded entities such as GGEDC, BID and C of C should be utilized as facilitators to attract big-time private developers as well as investors among our own plethora of millionaires, with intentions of creating an Entertainment District. This would also serve as a means for our current downtown to thrive as an Arts and Cultural District, each side of the tracks promoting the other. This is where a Master Developer Agreement comes into play – in part two, next week.